While reports of the outright death of the Deus Ex franchise may have been exaggerated, there may be change coming to the franchise over the coming years, as Mankind Divided developers Eidos Montreal have updated their public Vision Statement for the company. Between statements from studio head David Anfossi and Director of Online Technology Sebastien Bessette, they detail an online-focused future for the company, and a need for them to ‘continually provide players with content’. Unsure as Deus Ex’s future may be, there’s been plenty of stealthy goodness and immersive sims over the past few years. Here’s some of our choice picks. Probably the most interesting part of their statement is that their Dawn Engine – as used to flexible effect in Mankind Divided – is still in use and being retrofit to match their plans for the future, rather than switching over to some more popular codebase. It should be kept in mind that ‘online’ does not necessarily mean ‘multiplayer’. 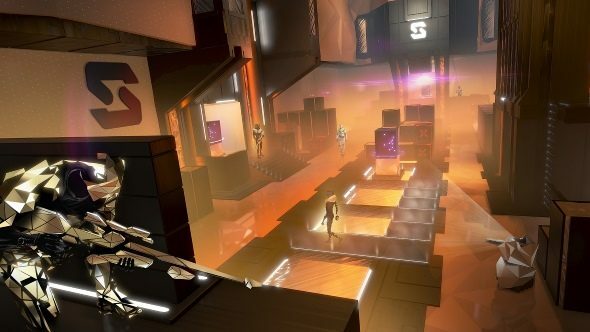 While wildly unpopular (I liked it, but I’m weird), Deus Ex: Mankind Divided’s F2P spinoff Breach was still a single player game, albeit with online leaderboards and challenge-issuing mechanics. That said, they do also have three job vacancies posted directly under their new mission statement, including an online multiplayer programmer and someone familiar with the PSN and Xbox Live SDKs, suggesting that their future projects may have a slightly more multiplayer slant. This is entirely speculation, though. What is certain is that Deus Ex: Mankind Divided wasn’t the hit that the publisher were hoping for, and very few even tried the spinoff game, Breach, despite a hefty free expansion released some time after launch. While Deus Ex may return in the future – presumably once the Montreal studio are done with their Marvel contract work, it probably won’t be quite how you remember it being, as and when it does return to the limelight. It’s all come full circle. As things were before the revival of Deus Ex, nobody can quite predict the future of the immersive sim genre, but ou can bet it’ll be interesting – and the source of many passionate debates – when it does come into vogue once more.